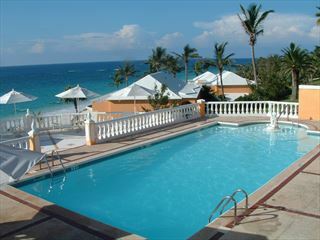 The Grotto Bay Beach Resort is a great value for money, family resort and is the only all-inclusive resort on the island. Grotto Bay sits on a lush tropical estate featuring dramatic caves and acres of woodland preserves along the waters edge in Bailey’s Bay. 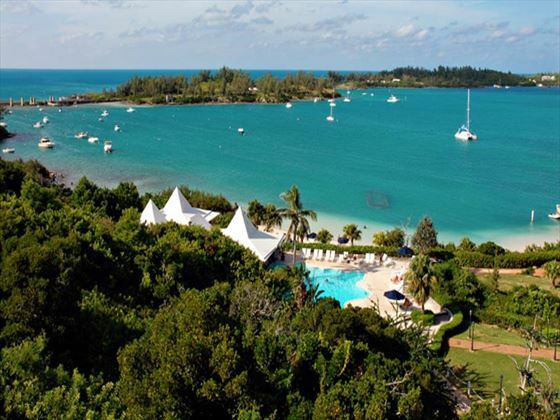 Scattered over 21 acres and sloping down towards the waters edge and three private pink sand beaches are 11 brightly colored, cottages in traditional Bermudian architecture overlooking the turquoise waters dotted with small islands. The Great House with stunning views of the grounds and ocean will make you feel relaxed in a luxurious environment. Darkwood floors, fire places, antiques, tropical colors and spectacular views from every room make the Great House a great place to relax and mingle at the bar or have an exquisite meal in either of the twi restaurants. 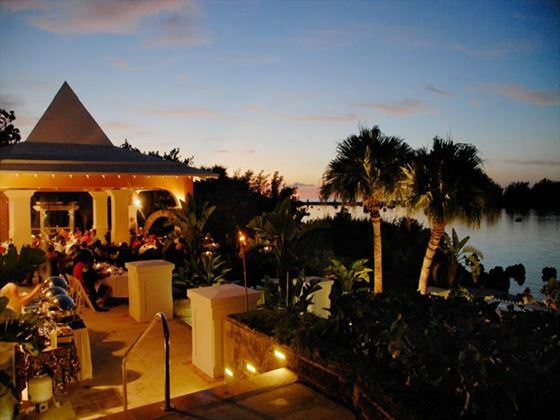 After dinner, enjoy the warm tropical breezes on one of the terraces surrounding the Great House. 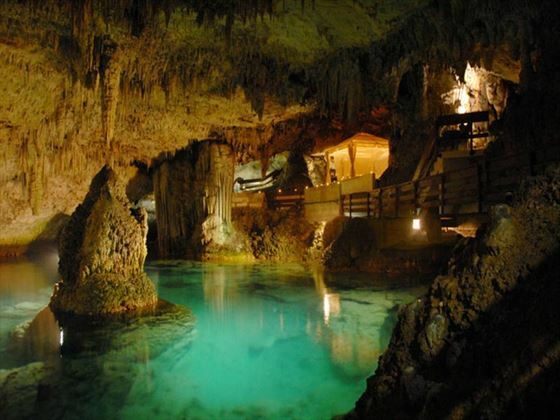 This resort was named Grotto Bay due to the several Grotto’s, which are used as an absolute unique spa facility and within another Grotto, Wedding’s Private Dinners can be held. You'll find this gorgeous retreat amongst a luscious tropical estate, offering a plethora of naturally beautiful attractions, including woodland preserves and intruiging caves. 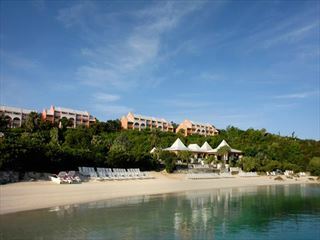 Stretched along Bailey's Bay and offering three private beaches, Grotto Bay feels like a exotic escape. Located on the ground floor, these comfortable, modern and easily accessible 33sqm rooms are set back on the hillside near the main clubhouse, featuring stunning views of the bay from a private patio. Accommodates up to four guests. Boasting spectacular panoramic views of the ocean from a serene hillside location, these gorgeous 33sqm rooms are elevated on the second and third floors, featuring breath-taking views across the glistening bay from a private balcony. Accommodates up to four guests. 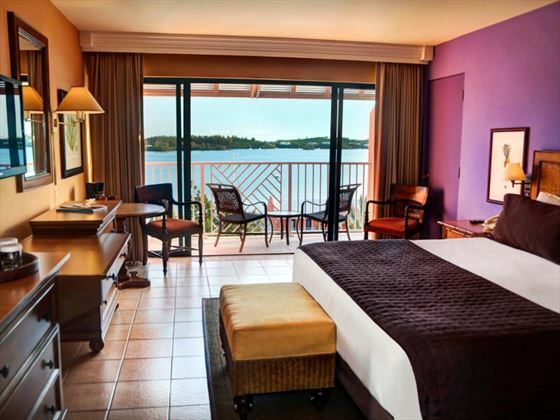 These sumptuous 33sqm rooms are located closest to the pool and waterfront, featuring walk-out access from a ground floor location. A private, furnished patio also offers partial views of the Bay’s calm, clear waters. Accommodates up to four adults. 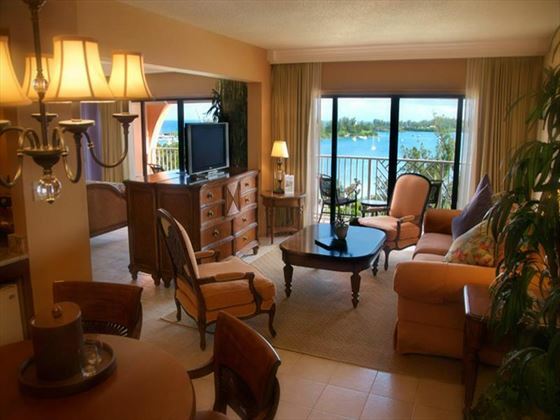 Located along the waterfront near to the pool, these luxurious rooms showcase unforgettable ocean views from a heightened setting overlooking the bay. Accommodates up to four adults. An elegant, sophisticated setting serving traditional European cuisine infused with vibrant Bermudian flavour for breakfast, lunch and dinner all year round, in addition to a wonderful Sunday Brunch. Jeans, trainers, flip flops and shorts (except Bermuda shorts) are not permitted. 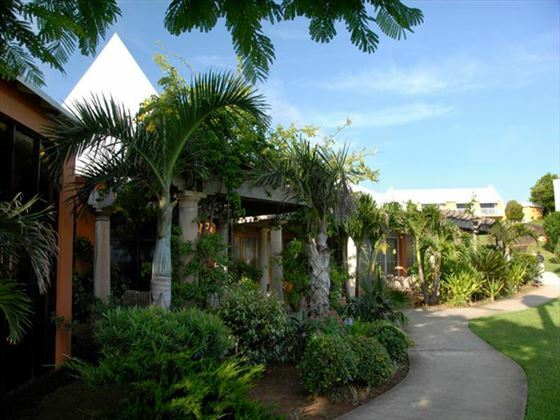 Serving casual dinners and light fare, this gorgeous restaurant is adorned by majestic palms and stunning tropical scenery with a relaxed atmosphere. Enjoy a menu inspired by island flavours and techniques, alongside a tempting list of exotic beverages and refreshments. The resort’s main bar is located in the Great House, offering an extensive beverage list with live entertainment all throughout the week. Set along the water’s edge, Bayside serves delicious lunches and tropical drinks beside fabulous vistas and cool ocean breezes. This venue also hosts two exceptional themed dinner evenings per week, including a Monday Island BBQ and a Thursday Surf & Turf Grill; both of these are extremely popular so reservations are required. A water sports shop offering windsurfers, sailboats and motorboats for your enjoyment. A tennis centre with four courts two of which are lit for night play. Golf is available at several nearby championship golf courses. A children’s programme is available during school holidays. In addition, a small children’s playground is available. Grotto Bay Water Park (seasonal) - huge slide, super soaker sling shot and trampoline are some of the activities to try.